Dan anchored Nightline on Friday, February 7th. The episode investigates Woody Allen, and his response to the open letter written by his daughter, Dylan Farrow, that he molested her as a child. Allen begs the question if the letter was even written by Dylan or guided by her adoptive mother, Mia Farrow, whom Allen was in a relationship with for over twenty years. 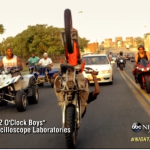 The next segment takes a turn and looks into the ” 12’O Clock Boys”, an urban dirt biker group that is the subject of a new film exploring their attraction and motivation. Although being in a biker group might not seem like the best extracurricular activity for a young boy, this biker crew might be the best option for those living in a tough neighborhood, looking for an extended family. Watch the full episode here.